The best Russian translator online or localization specialist is hard to find nowadays. Hiring the wrong English to Russian translator can make or break your marketing strategies. Because the potential damage caused to your online presence as a result of poor quality Russian localization could have a negative impact on your brand in the market. There are so many freelance English to Russian translation services provides on the Internet. It’s very important to choose the best one carefully to translate English to Russian and to avoid useless Russian localization or translation and to save costs. Here are some questions you need to ask the translator before hiring to translate a website and why. Gathering this information will help you separate the wheat from the chaff when it comes to finding high-quality English to Russian translation services. Finally, you don’t need to ask all of these questions. Just choose the one which is relevant to your situation. 1. What effective viral marketing techniques will be implemented into the localized content? If the translator & localization specialist is reluctant to enumerate the viral marketing techniques, be wary. There is a big possibility that you will simply get English to Russian translation services rather than content localization into Russian. And in this case, your investments might be useless in the Russian marketplace. Localized viral images could break Russian-speaking Internet. The Russian translator who is specialized in website localization into Russian will immediately tell you about your viral images and your brand storytelling. Localized viral images are very important, they could break Russian-speaking Internet. As for storytelling content, the best English to Russian localization service will be able to provide culturally relevant emotional elements. And in this case, your content in Russian would be able to touch the hearts of your potential Russian customers. With the right Russian localization services you can stand out from the competition in your industry in the Russian-speaking countries, effectively connect with your target audience and strengthen your brand. 2. How to apply globally valuable content marketing strategy across Russian-speaking marketplace with localization services and avoid failing? Not all products resonate the same way around the world. Content marketers are challenged to maintain consistent, universal, and recognizable branding and content, but also adapt their content across subgroups and cultures. When choosing the best translator, make sure he or she will translate English to Russian and adapt it across Russian-speaking marketplace and find out how. Every English to Russian localization project needs a style guide. If the best Russian language translator or localization specialist provides language services to you without it, then you are in trouble: the services, you are getting, might be useless. Every localization project needs a style guide. conversion optimization, lead generation and management, email marketing, etc). The linguistic part: writing style, sentence structure, punctuation, spelling, formatting. A style guide is not a manual with language rules. It’s a document that helps localization specialists choose the preferred language elements. With the right style guide, the English to Russian translator will be able to keep all the objectives and tactics of your content marketing strategy applicable in the Russian marketplace. 3. What kind of SEO techniques to implement with Russian localization to double traffic to my website? Before you commit to a contract to translate website, make sure you know what SEO techniques will be applied to the content from English into Russian. Taking into account the readers of your content come from different cultures, it is utmost to apply such an SEO technique as “benefit-focused content curation” into localization process. While localizing, the best Russian language service provider must find benefits that your Russian-speaking readers want. It is quite possible that these benefits differ from the English-speaking audience. Find out how an English to Russian translator will define those benefits in your industry, what website sources will be searched to compare them with competitors in Russia. 4. How to increase ROI with the best Russian translator services? When discussing your project with a translator to translate English to Russian, double-check if he or she understands that the goal of your website localization is to expand in the Russian marketplace and increase ROI. Otherwise, your investments might be unprofitable. With the proper Russian localization services, you can get quality traffic in the targeted marketplace to increase ROI. Localization process starts with keywords research. The best translator has to determine the keywords that the Russian-speaking customers use to search for your products or services. These keywords would bring potential customers from Google search results. If there are no relevant keywords in the Russian localized content, then Russian-speaking customers will never know that your product or service exists. For this reason, ask the English to Russian translator how you can increase ROI with his or her services and what tools he/she uses to search for relevant keywords in the Russian marketplace. 5. How to promote a product in Russia through localization services? The best solution is to find the translator who is good at SEO and marketing in the Russian market. Most Russian translators will not actually provide you with Russian translation, marketing and SEO services combined. Most of them just do not specialize in that, they will just translate English to Russian without SEO specialities. If you google this question, you might see that there are the translation, marketing and SEO companies which collaborate together. They will solve your challenges but they will charge you three times: for translation, for SEO and marketing services. what tools do you use to search for the relevant keywords? how do you analyze competitors’ websites? how do you determine what value I can bring to the target audience? what viral marketing techniques do you use when localizing the content? what SEO techniques do you apply in the localization process? 6. How to promote a restaurant to Russian speaking guests through translation and localization? There are many different ways how to promote a restaurant: foodie photos, loyalty programs, social media accounts, email newsletters, etc. But if your restaurant is located in a tourist destination where most visitors are Russian speaking people, then localization into Russian could be a good idea. The professionally translated restaurant menu is one the ways how to promote a restaurant. With the right menu, you can show your customers that you are committed to quality in all aspects of your business. pay attention for specific terms (glossary) for ingredients, preparation methods and tasks. 7. How to increase sales in retail in Russia through localization? Should I just translate website as a text? If a potential English to Russian translator doesn’t know what to answer how to increase sales in retail in Russia, it means that he or she is not familiar with the localization process as well as with the translation services which can sell goods and services to the target markets. How to check if you have found the best Russian translator who knows how to increase sales in retail? Make sure that the Russian language translation service provider knows anything about SEO optimization as well as marketing techniques applied in the Russian marketplace. 8. How to succeed with a services marketplace in Russia through localization? Promoting services marketplace in Russia without a proper localization is doomed to failure. Russian-speaking customers prefer purchasing not only goods but also services in their own language. Thus, to get quality traffic to your services marketplace, you should obviously have the appropriate content with relevant keywords in Russian. Do you know what is services marketplace? What kind of viral marketing techniques can be applied to promote a services marketplace in Russia? How are you going to adapt our global valuable content marketing strategy into the Russian marketplace? How can you increase ROI of your services marketplace with localization services? 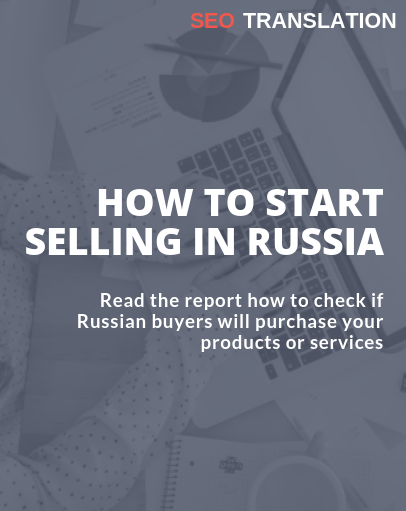 The key to the entire process to achieve the Russian-speaking target audience, to increase sales and profits at Russian marketplace is through the proper localization from English to Russian. No one wants to choose a black hat language service providers. With the questions above in hand, you can feel confident while asking your potential freelance partner.